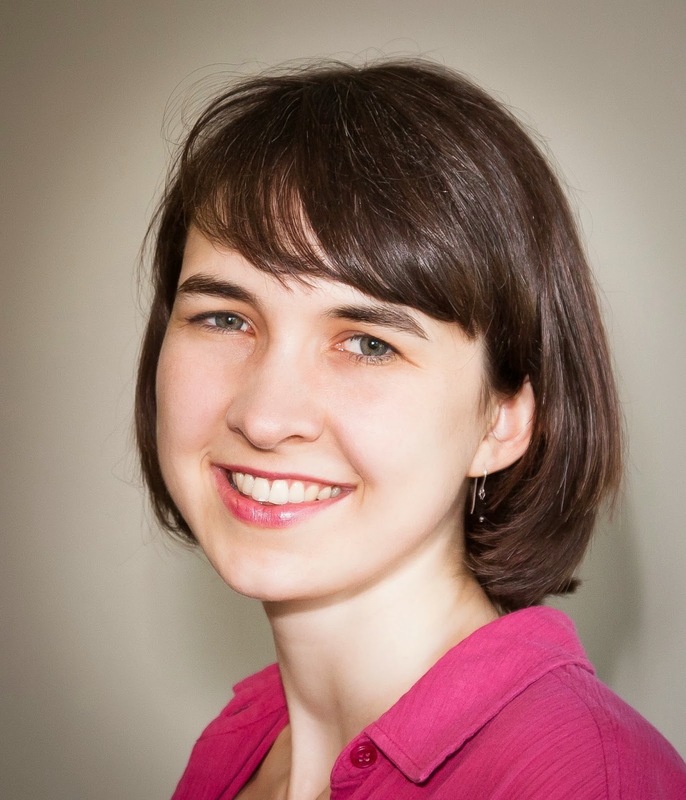 Today's post is another by guest blogger Kiersti Plog, who enlightened us about Indian mission schools last month. Leave a comment at the end for the chance to win a special Christmas prize! They were the quiet heroes of World War II. Forbidden to speak of their mission for 23 years after the war ended, even to their families and fellow Marines, they formed the lifeline of Allied communications through every Pacific battle from Guadalcanal to Okinawa. Under machine gun fire, shells exploding all around them, they cranked their radios and spoke into their microphones, in a language they had been punished for speaking as children. They were the Navajo Code Talkers. In 1942, the Japanese were cracking every American code the United States could come up with. Philip Johnston, the son of missionaries on the Navajo Reservation, suggested using the Navajo language. He knew from experience the complexity of this yet unwritten language, almost impossible to speak properly if not born to it. Somewhat skeptical, the Marines recruited a few young Navajo men fluent in both English and their native language. After Basic Training near Camp Pendleton, California, the twenty-nine Navajo recruits were locked inside a room to develop a code to confound the Japanese. In childhood, many of these young men had been beaten or had their mouths washed out with soap in government or mission boarding schools simply for speaking Navajo. (see October post) Now the government asked them to use that very same language to help America win the war. At this time, Native Americans were not even allowed to vote, yet these young Navajo men cheerfully stepped up to the plate. This country had been their home long before it became the United States. Of course they would do everything they could to defend it. So they set to work—developing the code, memorizing it until they became living code machines. Even a native Navajo speaker, if not trained in the code, could not decipher it. Each letter of the English alphabet was assigned a Navajo word, with more common letters assigned up to three, switched out to keep the enemy from picking up patterns. “A” could be wol-la-chee (ant), be-la-sana (apple), or tse-nill (axe). The code talkers also chose many individual words so they wouldn’t have to spell everything out. A dive bomber was gini, “chicken hawk,” while a fighter plane was da-he-tih-hi, “humming bird.” A battleship was a whale, lot-tso, a destroyer a shark, besh-lo. About 400 Navajos served as Code Talkers over the course of the war, with the Code expanded to include hundreds of words. Messages that took hours by code machine took a couple of minutes through the Navajo radiomen. On Iwo Jima alone, the Code Talkers worked for 48 hours straight, sending over 800 error-free messages. Major Howard M. Connor wrote that without the Navajos, the Marines would never have taken Iwo Jima. And their Code was never broken. It’s hard to know what the outcome of World War II in the Pacific would have been without these the Code Talkers. Yet after the war, they went quietly back to the reservation. They still couldn’t vote. They were refused service in most bars. Under strict orders not to mention the code, they couldn’t even tell their families what they and their language had done. In 1968, the military declassified the Navajo Code, but these men didn’t receive official recognition until 1982, when President Ronald Reagan established August 14 as National Code Talkers Day. In 2001, President George W. Bush presented Congressional Medals of Honor to those Code Talkers still living and able to travel. Two summers ago, I shared dinner with a Navajo Code Talker and his wife in Kirtland, New Mexico. What a privilege to sit beside this man with bent shoulders and a Marine cap, rattling off dates and memories I tried to capture on my laptop. With typical Navajo modesty, he brushed off any attribution of expertise. “It was just natural for me to talk Navajo,” he said. Kiersti Plog holds a life-long love for history and historical fiction and lived with her family for five years in New Mexico near the Navajo Reservation. Her yet-unpublished novel Beneath a Turquoise Sky is set at a Navajo mission boarding school and received the ACFW Genesis Award for Historical Fiction in 2013. She writes stories that show the intersection of past and present, explore relationships that bridge cultural divides, and probe the healing Jesus can bring out of brokenness. A member of American Christian Fiction Writers, Kiersti loves learning and growing with other writers penning God’s story into theirs, as well as blogging at http://www.kierstiplog.com. Leave a comment to be entered in a drawing for a two-book gift set of Guideposts books A Cup of Christmas Cheer! This collection of new fiction contains stories by some of our own CFHS authors Susan Page Davis and Marilyn Turk. Thank you Kiersti for this fascinating look at the Navajo code talkers! I had never heard of them before ~ yoou have defenitely piqued my interest! Thanks for the chance to win the Christmas Cheer books! You're very welcome--thanks for stopping by! 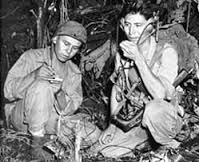 Yes, it's amazing how little known the Code Talkers still are...that's why I want to write a book about them. :) Just make sure to list your email in order to be entered in the drawing for the Christmas Cheer books! Blessings to you! Kirsti, I've admired these men for years. In Oct. I was in Monument Valley, Utah, at the Navajo Tribal park where these gentlemen have a special exhibit commemorating their heroism. Sorry, didn't mean to misspell your name, Kiersti! Haha, no problem, Laurie--I've gotten lots of variations over the years! Wow, I didn't even know there was a special Code Talkers display in Monument Valley...I haven't gotten to that part of the reservation yet. How cool. Thanks so much for stopping by and sharing! Good morning, I was amazed to see such a young girl with this post today of the Navajo history of long ago..good job Kiersti. I remember a movie with Nicolas Cage called "Wind Talkers" wasnt that something like this? thanks for sharing with us. I am anxious to read that Guidepost Christmas story. Hi Paula! You're right--Windtalkers is the only big Hollywood film I know of that includes Navajo Code Talkers. Thanks so much for stopping by and entering the Christmas Cheer drawing! Such an interesting post. I am so glad President Reagan came through for the Navajo Code Talkers. Thank you for what you do and the giveaway. Congratulations on your Genesis award. I tried to find you after the banquet, but got caught up in picture taking. I loved this post as the Code Talkers have fascinated me ever since I learned about them from my father after the war. Took our government long enough to recognize these men, but it's wonderful they finally did. Again, we have something to thank Reagan. BTW: I knew you had a good story, and I'm sure it will be picked up and published one day. Thank you so much, Martha! You were so sweet and encouraging to me when i met with you for a critique at my very first ACFW two years ago; I've often thought since of a couple of pieces of advice you gave me then. :) How fascinating that you learned about the Code Talkers from your father--was in he in World War II? Did he know about the Code Talkers before their work was declassified? I'd love to hear more! Kiersti, your post of the Navajo Code Talkers was very interesting. I am so glad they were finally given the honor due them. Thank you too, Jackie! I'm so glad you enjoyed the post. Blessings! Very interesting. I've heard about this code, but didn't realize the supreme secrecy they had to maintain after the war. It must've been very difficult to keep quiet while they were being despised in public. Very sad. Thanks for taking the time to bring this issue to light. 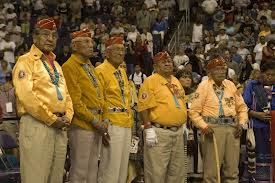 I was so surprised and blessed to have met 5 of these Code Talkers two years ago in New Mexico. It was not planned and I even got a video of them speaking in code. It was so special. That is so cool, Morgan! I've only had the chance to meet one in person as yet--a couple of other potential meetings have fallen through. And fewer and fewer of them are around anymore. :( How was it you happened upon five at once? Was it a special event? What a wonderful picture too--thanks for sharing! I have heard of the Navajo code talkers but don't know much about them. Thanks for sharing! It must have been hard for them to not be recognized for their service for so many years. Thanks for stopping by and entering the Christmas Cheer drawing, Patty! Blessings to you! Thank you for sharing this fascinating post, Kiersti! 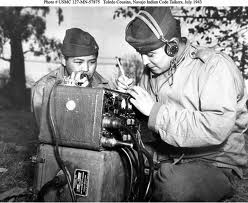 I have always found the code talkers so interesting; their help was invaluable! I am so glad they finally received the recognition they deserved! I agree, Britney. Thanks so much for stopping by! Blessings to you too! Thank you, Chris! Yes, they definitely were. Thanks, Susan! So glad you enjoyed it. Love this, Kiersti. Thanks for shining a light on these men who are some of my heroes. The part that I didn't put together for many years was that they were being asked to speak a language in defense of a nation that had punished them for doing so as children. I wish more of them could have been honored sooner. Thank you, Lori! Yes, so do I. And I didn't get that connection at first either, but others quickly made it for me. Thanks so much for stopping by! It is amazing, isn't it? Thanks for stopping by, Eliza! Very interesting post. I love reading about Native Americans. 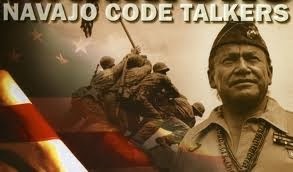 I have heard of the code talkers but did not know much about them. Thank you for the chance to win. I loved this post. The Navaho code talkers have long fascinated me, and I recognize them as real heroes. I'd love to win the giveaway. I would love, love, love to win a copy of thee fabulous books. I've read about several of the stories contained in these books, and I'm so impressed with the talent of these authors. Thank you for featuring Kiersti and her story involving the Navaho. I am thoroughly enjoying the features from this compilation of stories! Yes, I'm sure whoever wins these books will be in for a treat--my friend and critique partner Marilyn Turk has a story in there, and I know several other writers who do too! Thanks so much for stopping by, Nancee. Blessings! I've read such great reviews and would love to win. Enjoyed reading and learning about the Navajo Code Talkers. Thank you for the opportunity to participate in this giveaway and please enter my name. 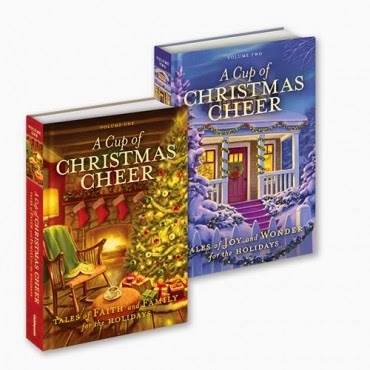 Susan P. has won the drawing for the autographed copy of the Cup of Christmas Cheer Books! Congratulations, Susan! I'll email you privately to get your address. For anyone else who would like to order the books, here is the link: http://www.shopguideposts.org/new-releases/a-cup-of-christmas-cheer.